The pilot features planters of greenery that thrive in low light on elevated platforms below large stormwater drains, and extend the public space away from cars while offering an alternative pathway for pedestrians. It also came with a fresh paint job for the adjacent support structures, brightening the area and setting it apart from the rest of the highway trusses. The pilot is also intended to offer replicable techniques that could be deployed throughout the city’s millions of square miles of underutilized space. The Perfect Light – What is your Favourite Light Source? Schwendinger joins with international colleagues to answer questions from London-based filmmakers, Light Collective, to see how thoughts might vary from country to country and designer to designer. This short clip is an extra to the long form which is on tour in London, Paris, Milan, New York, Berlin, Reykjavik, Zurich and Dubai. An artist and lighting specialist is spending a week speaking to a studio of Portland State University architecture students, stressing the importance of incorporating nighttime elements into their designs. A discussion focused on the connection between the history of public lighting, historical buildings and visual smog (or visual clutter). Photos in beautiful black and white. We caught up with Schwendinger, one of the world’s leading voices on the impact lighting can have in our cities. A six minute audio lesson on nighttime design urbanism. 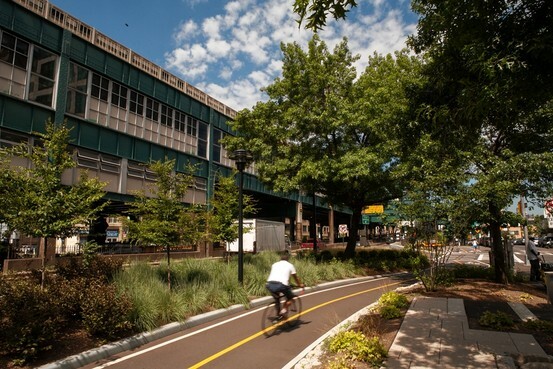 The Design Trust for Public Space’s Under the Elevated Phase II looks to reimagine and reclaim the neglected spaces under New York City’s elevated lines through pilot projects. This pilot phase, which began in 2015, is being facilitated by three Design Trust fellows: urban designer, Quilian Riano; lighting designer, Leni Schwendinger; and landscape architect, Tricia Martin. It especially interested me to view these kinds of conditions as a connector. How can we create them as a seam? As a connector? As a way to actually stitch places together rather than divide them and work counter-intuitively to turn this unloved and difficult space into an asset? Turning off street lights at an arbitrary time such as midnight may appeal to city leaders. After all, doesn’t it save both money and energy? I don’t believe it’s this simple. Instead, I think the rise and fall of public lighting in a city should be determined by the activity on its streets and pavements. This more nuanced approach would see light provided when it’s needed. Ultimately, night-time is essentially different from daytime. So it deserves its own design approach, and thinking creatively and smarter about street lighting is a vital part of this. American lighting designer Leni Schwendinger, who was invited to the forum “Imagine the light”, toured the historic center of Bogota and places like the Plaza de Bolivar. Her impression is summarized in a contrast: the joy of noticing charming and distinct architecture is worth preserving, but it is sad to notice that lighting, which is so important to the city, is being overlooked. Leni Schwendinger’s work highlights the idea of ​​simple projects that can change people’s perceptions of a space. Schwendinger stressed two important lessons for the city, one: that the quality of the sidewalks and roads with pedestrian oriented lighting is better, and two: nice small light environments are created. That’s a start. La estadounidense y diseñadora de iluminación Leni Schwendinger, invitada al foro “Imaginemos la luz”, recorrió el centro histórico de Bogotá y lugares como la Plaza de Bolívar. Su impresión se resume en un contraste: la alegría de notar una arquitectura encantadora y distintiva que vale la pena preservar, y la tristeza de notar un descuido en la iluminación en una zona tan importante para la ciudad. Leni Schwendinger, la diseñadora estadounidense, destaca en su trabajo la idea de hacer proyectos sencillos que cambien la percepción de la gente sobre un espacios como los puentes vehiculares… Dos lecciones importantes para la ciudad que resaltó Schwendinger es que se mejore la calidad de los andenes y caminos con iluminación orientada a los peatones, y que se creen pequeños ambientes de luz agradables. Ese es un comienzo. The idea of activating the nightlife in a city … is a model worth replicating, [when] city meets three basic conditions: optimal security, good lighting and development of public space. 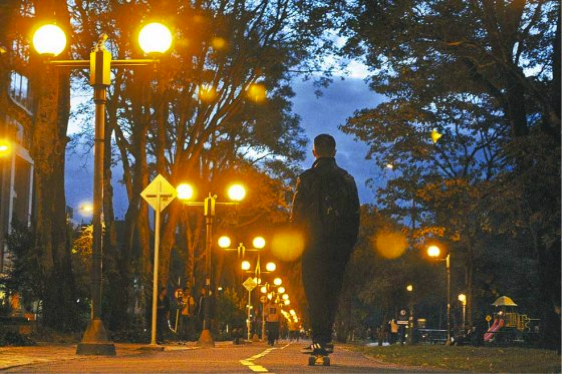 Leni Schwendinger, an expert in night design, lighting and infrastructure, came to Bogotá two days ago to participate in the Imagine Light event, organized by the Chamber of Commerce of Bogotá which will be held this Friday. Leni currently works at Arup, a company that develops civil engineering, water and energy projects in more than 10 countries worldwide. ‘La meta es que la gente salga de noche y use el espacio público’, Experta en diseño nocturno e iluminación plantea unas condiciones para que ciudades se modernicen. La idea de activar la vida nocturna en una ciudad para convertirla en un lugar con movimiento las 24 horas es un modelo que vale la pena replicar, si la urbe cumple con tres condiciones básicas: óptima seguridad, buena iluminación y desarrollo del espacio público. Así lo considera la experta en diseño nocturno, iluminación e infraestructura Leni Schwendinger, quien llegó a Bogotá hace dos días para participar en el evento Imaginemos la luz, organizado por la Cámara de Comercio de Bogotá y que se llevará a cabo este viernes. Actualmente trabaja en Arup, una empresa que desarrolla proyectos de ingeniería civil, agua y energía en más de 10 países del mundo. 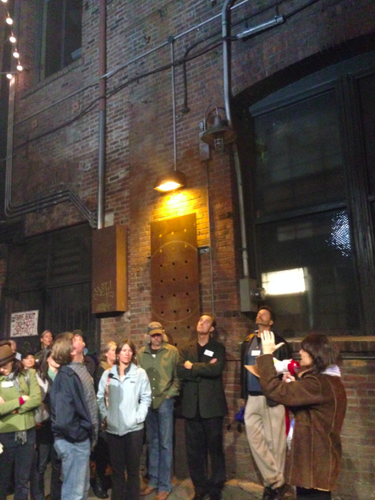 Last night, I tagged along with a group of Pioneer Square residents (and apparently a nerdy mix of theater design geeks, urban enthusiasts, and flâneurs), as New York City “NightSeeing” expert Leni Schwendinger gave a walking tour of Pioneer Square. Schwendinger, who reads the world in patterns of light and shadow, is an expert in things most people never stop to see. She points out the dramatic shadowy shapes created by the girders that hold up the subway tracks. She calls attention to the changing colors of the grime-encrusted traffic signals that hang from the underside of the hulking structure — glowing points of red, amber, and green that she calls “the jewelry of the night.” She admires the way light peeks through the stairs that lead up to the station platform above, showing the feet and ankles of travelers going up and down. She asks us to imagine how all these glorious steel beams and rivets would look if lit with deliberation rather than by default. … Ms. Ruddick and her team—including Marpillero Pollak Architects, Judith Heintz of the landscape architecture firm WRT, artist Michael Singer and lighting artist Leni Schwendinger—faced in attempting to transform Queens Plaza from a wasteland of potholed roads, a parking lot and elevated subway tracks into a greenway that would attract businesses and greet pedestrians and motorists arriving in Queens. Leni Schwendinger’s NightSeeing event took to the streets of Frankfurt to interpret the light and shadows of the city’s nightscape. I want to make the unknown known. The unseen, seen. I try to bring out the hidden aspects of a place and make it available and understood through light. Commentary by Leni: Light Projects design for Times Square… my radical idea of removing lighting was not to be, but the premise; capturing the light of the billboards and reflecting it back, will. My thunderbolt of inspiration was a vision of highly detailed patterns, in a series of “throw rugs” across the paving. Counter-intuitive to the current large-scale painted road-edge pattern. Snohetta intertwined the two ideas by implementing a small pattern of scattered stainless points and the concomitant reflections – viola! NightSeeing Frankfurt will take place on Wednesday, April 18th, 2012 in Frankfurt am Main, Germany. After 15 years of public planning and collaboration, a project that beautifies the San Diego waterfront, a $28.6 million project, will finally begin. The North Embarcadero Visionary Plan Phase I Project, which incorporates an area on North Harbor Drive – from the Navy Pier to the B Street Pier and a portion of West Broadway – will break ground Thursday, January 5, 2012, at 10:00 a.m. The event is open to the public. The Port of San Diego, City of San Diego and Centre City Development Corporation (CCDC) will celebrate its start with a groundbreaking ceremony on the western edge of Lane Field, located at the corner of West Broadway and North Harbor Drive. The North Embarcadero Visionary Plan Phase I is part of a comprehensive project to beautify the waterfront and create new public open space that welcomes residents and tourists. The project also includes significant improvements to roadways, utilities and storm water systems. When completed, a 105-foot wide esplanade will adorn the waterfront. The esplanade will have formal gardens, plazas, shade pavilions and a waterfront promenade that will allow downtown residents, workers and visitors to stroll, jog, cycle, enjoy public events or just relax. West Broadway will serve as a gateway connecting downtown San Diego to the bay. It will be defined by special paving and medians, rows of elegant Medjool Date palms and decorative lighting. In the future, adjacent developments will further enhance the area with additional public spaces along the gateway to the bay. The North Embarcadero Visionary Plan Phase I Project is a green project. Drip irrigation will be used to water drought-tolerant plants, and the project has the ability to use reclaimed water in the future. Storm water drainage improvements will provide a water treatment system along the bay front esplanade on North Harbor Drive, preventing pollution from entering the bay. Featured public art includes internationally-acclaimed artist Pae White’s designs, which will be integrated into the project’s architecture. White will embed words from the popular 1970 novel Jonathan Livingston Seagull by Richard Bach into the roofs of pavilion buildings. The words will cast sunlight on the ground during the day and be illuminated on the roofs at night. USS Cal Builders was awarded the construction contract for the project in November 2011. It is anticipated that the $28.6 million project will be completed in the summer of 2013. The design team for the project is led by Project Design Consultants and includes Civitas, Spurlock Poirier Landscape Architects, Joseph Wong Design Associates and Leni Schwendinger Light Projects LTD, among others. “It’s quite a complex art form,” says urban illuminator Leni Schwendinger, who designed the lighting for Toronto’s H2O Park. “Plain Jane street-lighting is not so Plain Jane really — and if you put it all together, the shop lights, the neon, the signals, the headlights, you have an interesting urban composition,” she says on the phone from her Manhattan studio. Leni Schwendinger, whose pioneering use of civic illumination to transform infrastructures and public spaces, is recognized by Architectural Digest in both print and online video. 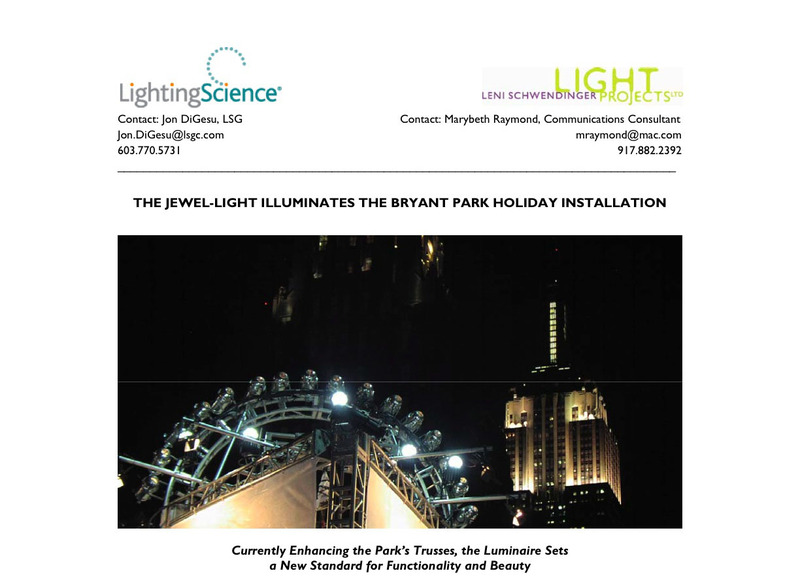 The article, entitled “Lighting the Way”, features three U.S. projects – Triple Bridge Gateway in New York City, Tidal Radiance in San Diego, California, and the Hoboken Ferry Terminal in New Jersey. “Leni has become a recognized authority on the issues and applications of urban lighting and public art, as she has gained experience creating illuminated environments all over the world.” The video, “Designers Take Flight” focuses on an interactive video artwork at Liberty Science Center, Times Square and other high profile locations. Second Street Transportation & Streetscape Project | Louisville | Light Projects & CARMAN The road under the Second Street Bridge has been transformed into a plaza — filled with plantings, seats and pedestrian spaces to host festivals and celebrations — shaded by the dynamically illuminated overpass. Questions and Answers: Leni Schwendinger with discussion and images of Triple Bridge Gateway and Dreaming in Color. “Lumens for Humans” originally published by Landscape Architecture has been reprinted by Lighting India. Comment> Leni Schwendinger Lights the Way. A renowned lighting designer takes a walk in the dark in search of illumination. Savor the word “light” and the interior landscape of language evokes images of atmospheric effects—mysterious, picturesque, sublime…. City Announces Start of Temporary Redesign of Times Square, Selection of Team to Lead Permanent Redesign of Area. Painted treatment will revive the area as the internationally recognized architecture firm Snohetta will lead a team to redesign and reconstruct the area, upgrade infrastructure. Light Projects joins the Snohetta team to illuminate the new, permanent Times Square. The federally owned plaza where Richard Serra’s controversial Tilted Arc sculpture once stood—and now sprawls landscape architect Martha Schwartz’s composition of planted mounds and bright-green curling benches—is getting another makeover this spring. “A public space like that envisioned by the Beltline, with pedestrian-friendly rail transit, trails, greenspace and abutting development in one corridor does not exist today in Atlanta or any other city in the United States,” said Brian Leary, president and chief executive officer of Atlanta Beltline. Indeed, it’s the kind of detail that’s easy to overlook, unless one is trained to notice it. 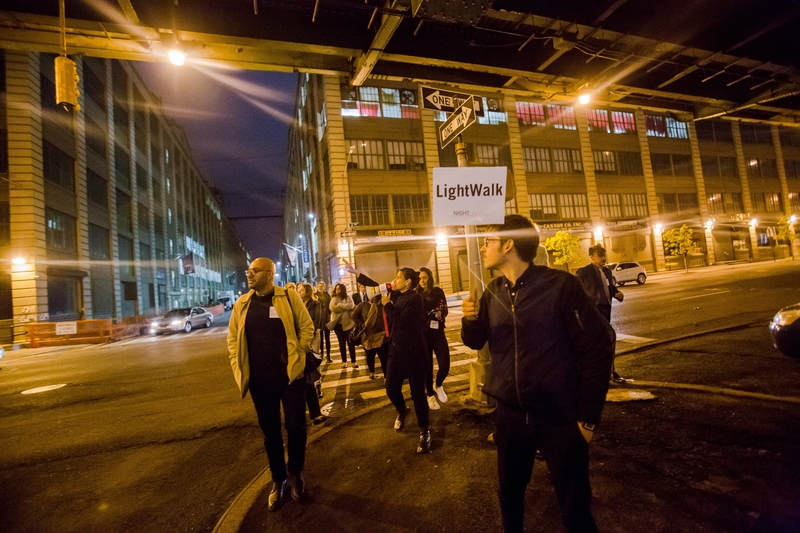 Schwendinger hopes to offer more Light Walks in the future, helping city residents become more attuned to the ways lighting designers bring safety, sustainability, and beauty to public spaces. Shades of Night: Why is Light Essential for Your Design? Leni Schwendinger is a bit of a night owl. But the principal for New York-based lighting design company Leni Schwendinger Light Projects LTD, has to be—it’s when she gets her best inspiration. In addition to working on such projects as the Chroma Streams, Tide and Traffic (Glasgow, Scotland), and the Coney Island Parachute Jump (Brooklyn, N.Y.), Schwendinger is a faculty member for the Architecture, Interior Design, and Lighting Department at Parsons School of Design in New York City. She also frequently hosts “ Night Walks” in the city, which are free and open to the public, to explore the affect of lighting in public spaces at night. Schwendinger recently spoke with Contract magazine to discuss the importance of light in design and how it can be utilized to influence and enhance any commercial project. New York is synonymous with the holidays. No city sparkles and dazzles residents and visitors alike with more lights than New York City during the holiday season. And, this year there is a brilliant addition to the seasonal display. The recently launched Jewel-Light(TM) Luminaire is lighting up The Pond at Bryant Park and, at the same time, doing its part towards “greening” the Big Apple. … on the PLDA Lightmapping event of November 10 and 18th 2009. Read about it, see the movie. Las actividades del 14 de octubre iniciaron con la conferencia “Embellecimiento de Ciudades”, enormemente ilustrativa a cargo de Leni Schwendinger. The first of [Leni Schwendinger’s] SpectraScape structures is more or less complete: a pair of green glass panels, each bending at a 90-degree angle into a roof. Seen from the right angle, Schwendinger pointed out, the roofs form a “V” that echoes the modern shape of the old Statler Hilton across the street. The park will include five of these setups, each with seating underneath and, of course, a line of multicolored lights crawling along the top. A dark-sky activist and a celebrated designer discuss the best (if not the brightest) ways to light the environment. 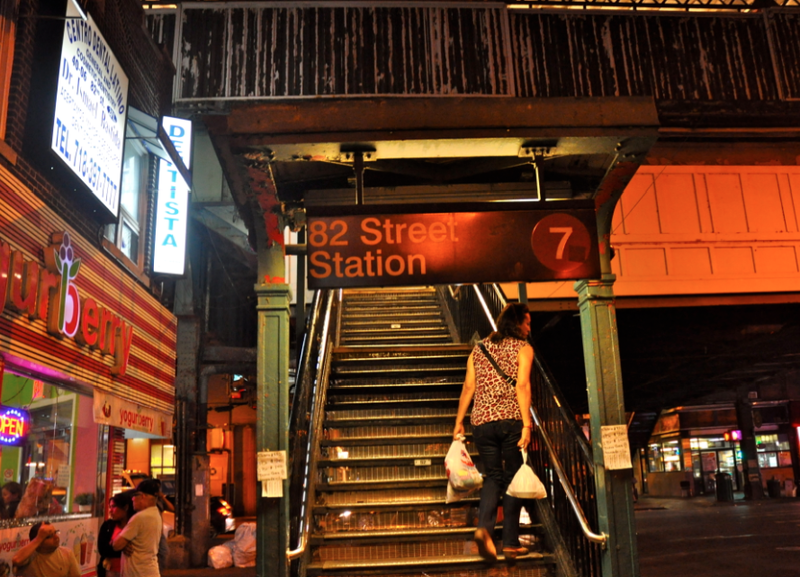 Is a well-lit neighborhood really safer? Is “pollution” the best way to describe excess light? The conversation continues between lighting designer Leni Schwendinger and dark-sky activist Susan Harder. Hot off the press from China! (NEW YORK) After more than ten years of community planning, design and construction, the bus ramps above Ninth Avenue at 40th Street have been transformed into an infrastructural public-art illumination installation that is delighting residents, visitors, passersby and motorists. Created in collaboration with the Port Authority of New York and New Jersey (PANYNJ) by the design team of PKSB Architects and Leni Schwendinger Light Projects (LSLP), a formerly desolate stretch of Hell’s Kitchen roadway—shadowed by exposed steel and concrete overpasses—now shimmers with color-infused light. 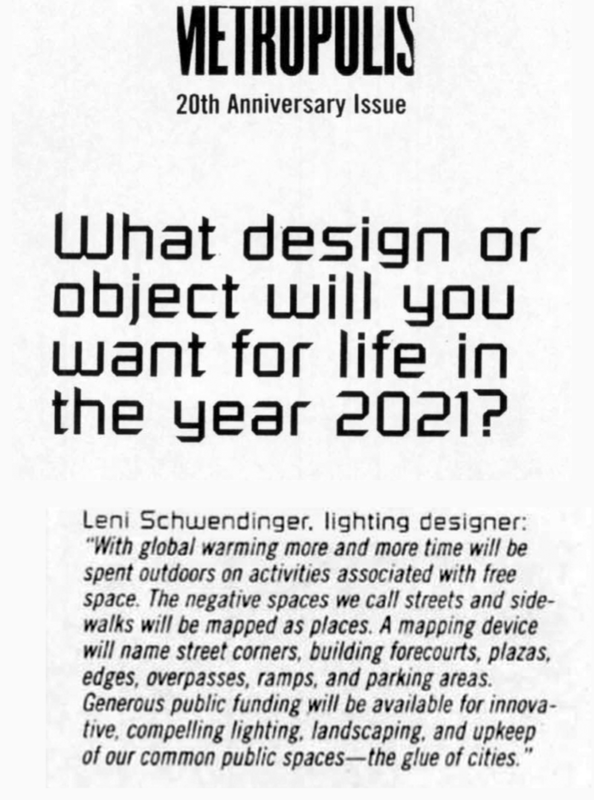 Notes lighting artist and designer Leni Schwendinger: “Instead of a place to rush through, our team has created a destination-—a dynamic urban oasis for the eye and a visual landmark for the community.” In 1994, Community Board #4 convened the Triple Bridge Task Force. Leni Schwendinger joined in this volunteer effort to solicit neighborhood input and create design guidelines for aesthetic renovation of the bus ramps. In collaboration with the PKSB team, Leni Schwendinger Light Projects LTD won the PANYNJ-invited competition to design architectural improvements to the overpasses. Recalls PKSB lead principal Henry Stolzman: “We saw this project as a rare opportunity to celebrate infrastructure and mass transportation – transforming both into art and architecture.” As the job grew in scope, facades on both the west and east side of the street were incorporated—including replacement with titanium panels of the terminal’s brick façade, creating a new entry marquee and opening commercial storefronts to enliven the streetscape. The design process for Triple Bridge Gateway began in 1996. A series of mock-ups and installations continued from 2001 through 2008. The design choices-—metals, lighting and color pattern-—were conceived as emphasis for the bridges’ I-beam engineered structure. A chain-link containment system wraps the sides and underside of each ramp. This highly-detailed stainless-steel metal mesh works to reflect and diffuse light, as well as providing full-time maintenance access. Multiple light sources illuminate the bridge structure and the area under the bridges without interfering with ramp-roadway lighting. Linear fluorescents emphasis the I-beam webs and bolted plates. Metal-halide CSI sources graze the mesh scrim, and wallpacks “wash” the bridge coffers with light. A sculptural addition creates “a luminous room.” Pendant-mounted, high-polish, adjustable reflector panels “pierce” the scrim. Metal-halide light sources on the east and west walls of the underpass focus onto the panels that, in turn, cast reflected light patterns onto the street. The reflections unify the existing lines and spaces of the bridges, and accentuate movement and animation as cars pass underneath. <!–[endif]–>Chambers of Color—This formal composition focuses on the beam structure and corner shapes. Reflections—Creates a connection of the street and the bridges’ underside through volumes of reflected light on the roadbed. Gail – lovely to meet you. I will answer directly to your email address. Looking forward to meeting you! I’m a postgrad student of Tim Edensor and Steve Millington at Manchester Metrpolitan University. I’m researching light festivals in the North of England, based on my own experience as a lantern procession producer, for example http://www.ocarts.co.uk/lighting-the-legend/lighting-the-legend-project-page/ltl16-on-the-shoulders-of-giants.html. Tim and Steve mentioned you come over to the UK regularly. I’d be really interested in attending any presentations you have planned? Anna – thanks for contacting me. How did you hear about us? Just checked out your intriguing magazine site. We will add you to the Light Projects LTD mailing list as requested. Let’s stay in touch!